Colipase is a protein that functions as a cofactor for pancreatic lipase, with which it forms a stoichiometric complex. It also binds to the bile-salt covered triacylglycerol interface thus allowing the enzyme to anchor itself to the water-lipid interface. 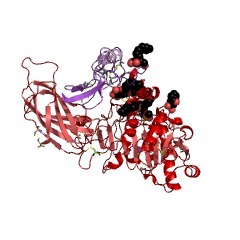 Colipase is a small protein of approximately 100 amino-acid residues with five conserved disulfide bonds. Colipase [(PUBMED:1567900), (PUBMED:3147715)] is a small protein cofactor needed by pancreatic lipase for efficient dietary lipid hydrolyisis. It also binds to the bile-salt covered triacylglycerol interface, thus allowing the enzyme to anchor itself to the water-lipid interface. Efficient absorption of dietary fats is dependent on the action of pancreatic triglyceride lipase. Colipase binds to the C-terminal, non-catalytic domain of lipase, thereby stabilising as active conformation and considerably increasing the overall hydrophobic binding site. Structural studies of the complex and of colipase alone have revealed the functionality of its architecture [(PUBMED:9240923), (PUBMED:10570245)]. 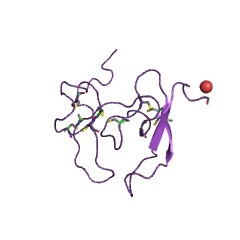 Colipase is a small protein with five conserved disulphide bonds. Structural analogies have been recognised between a developmental protein (Dickkopf), the pancreatic lipase C-terminal domain, the N-terminal domains of lipoxygenases and the C-terminal domain of alpha-toxin. These non-catalytic domains in the latter enzymes are important for interaction with membrane. It has not been established if these domains are also involved in eventual protein cofactor binding as is the case for pancreatic lipase [(PUBMED:10570245)]. There are 92 COLIPASE domains in 92 proteins in SMART's nrdb database. Taxonomic distribution of proteins containing COLIPASE domain. This tree includes only several representative species. The complete taxonomic breakdown of all proteins with COLIPASE domain is also avaliable. Click on the protein counts, or double click on taxonomic names to display all proteins containing COLIPASE domain in the selected taxonomic class. Molecular mechanisms of rat and human pancreatic triglyceride lipases. Dietary fats affect health and disease. The assimilation of dietary fats into the body requires that they be digested by lipases. One lipase, pancreatic triglyceride lipase, is essential for the efficient digestion of dietary fats. Pancreatic triglyceride lipase is the archetype of the lipase gene family that includes two homologues of pancreatic triglyceride lipase, pancreatic lipase-related proteins 1 and 2. In recent years, important advances have been made in delineating the mechanisms of lipolysis. The cDNA sequences encoding pancreatic triglyceride lipase and the related proteins have been described. 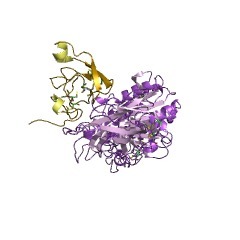 The tertiary structure of human pancreatic triglyceride lipase has been determined alone and in a complex with colipase, a pancreatic protein required for lipase activity in the duodenum. This structural information has allowed the rational design of site-specific mutants of pancreatic triglyceride lipase. Together with the structural information, these mutants have greatly advanced our understanding of the molecular details governing lipolysis. This review describes these studies, which will eventually provide the background for the rational design of nutrition therapy in patients with pancreatic insufficiency and fat malabsorption. Structure and function of pancreatic lipase and colipase. Dietary fats are essential for life and good health. Efficient absorption of dietary fats is dependent on the action of pancreatic triglyceride lipase. In the last few years, large advances have been made in describing the structure and lipolytic mechanism of human pancreatic triglyceride lipase and of colipase, another pancreatic protein that interacts with pancreatic triglyceride lipase and that is required for lipase activity in the duodenum. This review discusses the advances made in protein structure and in understanding the relationships of structure to function of pancreatic triglyceride lipase and colipase. Pancreatic colipase. Structural and physiological aspects. Interfacial adsorption of pancreatic lipase is strongly dependent on the physical chemical properties of the lipid surface. These properties are affected by amphiphiles such as phospholipids and bile salts. In the presence of such amphiphiles, lipase binding to the interface requires a protein cofactor, colipase. 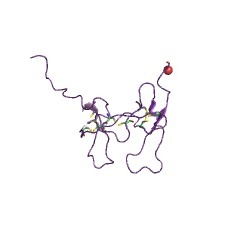 We obtained crystals of the pancreatic lipase-procolipase complex and solved the structure at 3.04 A resolution. Here we describe the structure of procolipase, which essentially consists of three 'fingers' and is topologically comparable to snake toxins. The tips of the fingers contain most of the hydrophobic amino acids and presumably form the interfacial binding site. Lipase binding occurs at the opposite side to this site and involves polar interactions. 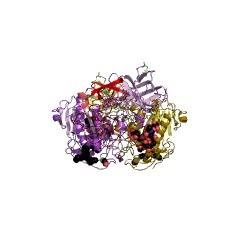 Determination of the three-dimensional structure of pancreatic lipase has revealed the presence of two domains: an amino-terminal domain, at residues 1-336 containing the active site and a carboxy-terminal domain at residues 337-449 (ref. 6). 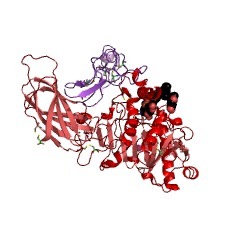 Procolipase binds exclusively to the C-terminal domain of lipase. No conformational change in the lipase molecule is induced by the binding of procolipase. By hydrolyzing the dietary triacylglycerols, pancreatic lipase causes catalysis in heterogeneous medium. In vivo, lipase action cannot take place without colipase due to the presence of bile salts. The cofactor enables lipase anchoring to the water-lipid interface. The lipase-colipase system furnishes an excellent example of specific interactions (protein-protein and protein-lipid). The studies of lipase catalytic properties brought to light the importance of certain parameters related to the 'quality of the interface'. The structure-function relationship analyses revealed a certain number of functional amino acid residues in lipase and colipase involved either in the catalytic site of the enzyme or in the recognition sites (lipase-colipase and protein-interface). Comparisons of the sequences of lipases derived from different sources display interesting similarities in certain cases.